Concrete | Sunrise Carpentry Inc. Creating a quality foundation for your business. 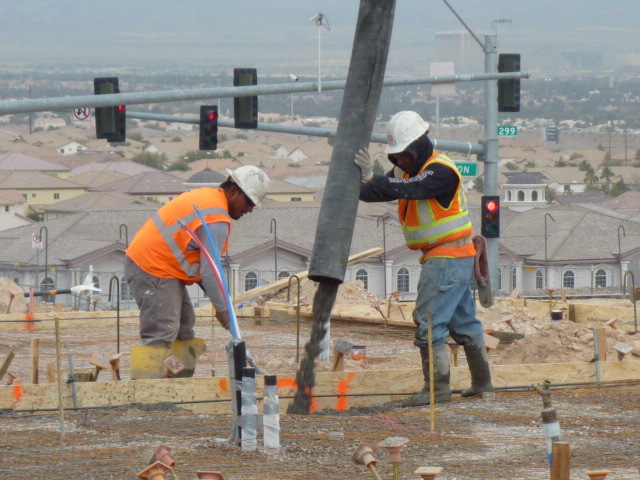 At Sunrise we do not just settle for making sure our entire field personnel are OSHA trained and certified. We also focus on delivering a safe product while insuring our employees arrive safely home at the end of every work day. Our success stems from providing a quality product not just once but consistently over the life of our company. We are able to achieve this by purchasing products backed by the same standards we hold ourselves accountable to as well as hiring the most knowledgeable and conscientious field personnel available. This combined with following our Quality Assurance Standards allows us to provide a finished product with outstanding craftsmanship. Sunrise employees understand that Excellent Customer Service is the best word of mouth advertising not only for our company but for our customers company as well. Therefore, when the need arises we will be there to perform whatever work is necessary to correct any issue in a timely manner and on the first visit. We continually strive to deliver a quality product at the least possible cost while meeting or exceeding the delivery guidelines set by our customers. In order to provide this service we must constantly review our operational procedures to insure we have the greatest efficiency possible. This review is what helps keep our operating costs low thus allowing us to be more competitive in the marketplace. We first layout and trench footings at the desired location and make sure we have placed the slab location as noted on the plot sheet provided. Secondly we backfill plumbing trenches and grade the pad to the specifications denoted on the plans. 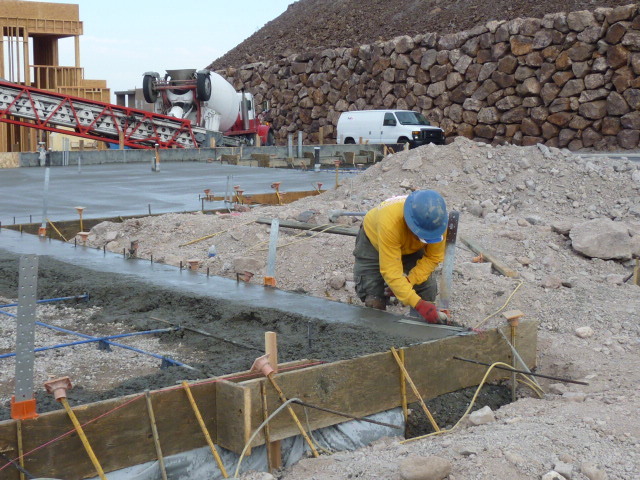 This is done by utilizing a base comprised of a fine aggregate that is compacted as well as a thick plastic barrier to help eliminate moisture penetrating beneath the slab once concrete has been poured. Next we place all steel rebar and hold down bolts, as specified in the plans. 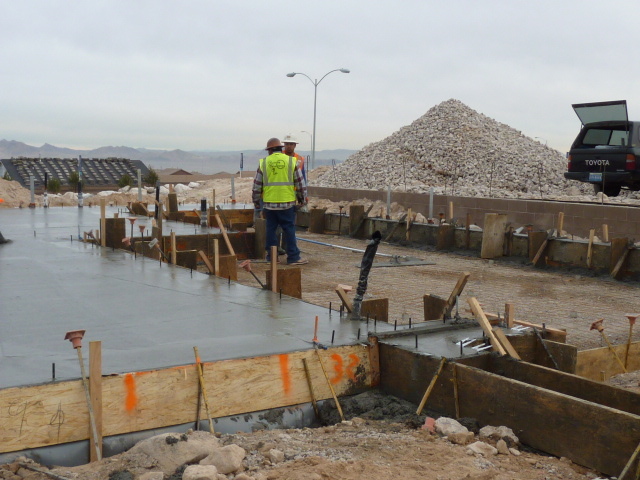 Then we place the post tension cables as well as double check all measurements to make sure the slab meets all design criteria in preparation for final inspection before pouring the slab. Once the final inspection has been obtained we will schedule the pour along with notification to the builder superintendent of our intent to pour. 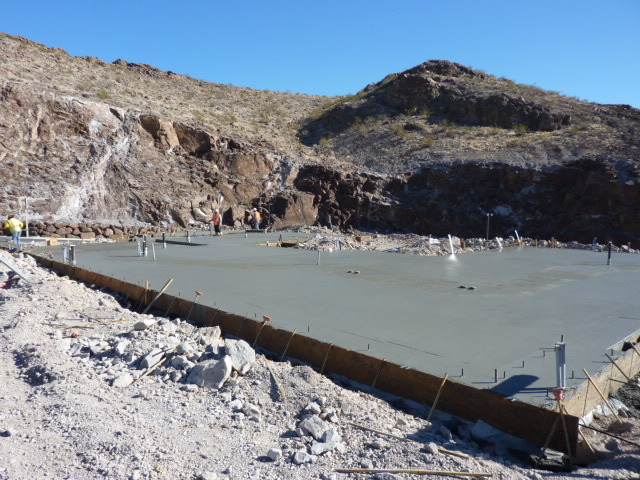 If the builder superintendent agrees with the pour date we then proceed with pouring the slab. After the slab has been poured we will again do a quality check to determine what work would need to be performed to get the slab ready for the framers that follow us. This could be grinding any high spots or fixing stem walls to insure a level area for the plate to be installed, just to name a couple. If need be we will replace any hardware that may have moved during the pour, this work would be done just prior to frame inspection. Finally, we perform any touch-up work the builder may require from a concrete standpoint. This is done to insure the end customer receives the finished product they are expecting and happy with.